I recently returned to Kiba Point from a long vacation and it is wonderful to be back. It's been a very exciting few days. The most recent group of guests were treated to some fantastic elephant and lion sightings as well as two leopard cubs in a baobab tree. 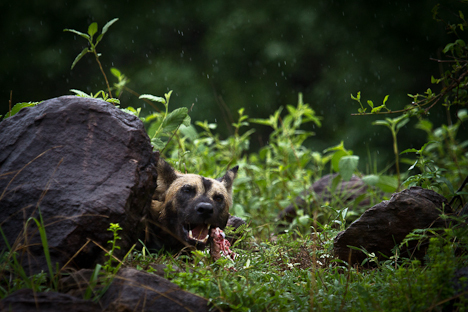 But to top it off, they got to see wild dogs for two straight days right very close to camp! We've been getting a bit of rain and the days have been overcast, which means that the weather has been perfect for these diurnal carnivores to hunt. We tracked the dogs from the garden up to the miombo woodland around the kiba airstrip where they caught a young impala. Since a baby impala is worth hardly more than a snack, the dogs were quickly ready to set off again. Unfortunately, I had to head back to camp but the guests stuck around to see the dogs bolt the length of the airstrip in pursuit of some unlucky impala. Wild dogs run too fast and too far to follow them on a chase, but since dogs are the most effecient hunters of all the large carnivores, it would have taken more than a little luck for all of the impala to escape. Given how well fed the dogs looked the next day, their hunting skills certainly weren't lacking.